No mere sprig nor stem for you this morning, my Darlings! 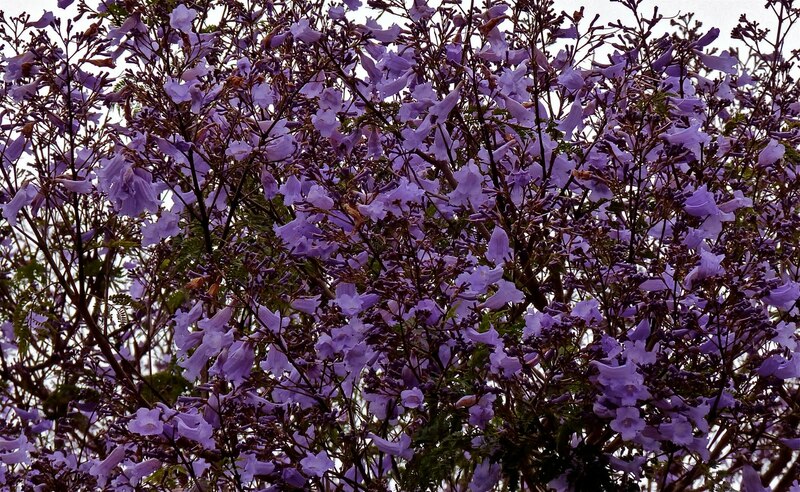 We celebrate the start of this fine week with the jacaranda tree--a celebration of purple that comes but once a year. 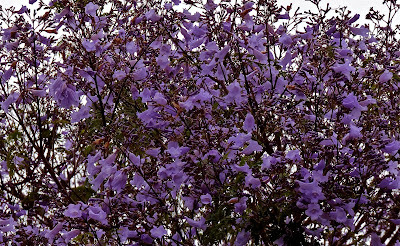 There are hundreds of jacarandas in our town and in my opinion, everyone should stop when he or she sees one, stand beneath the beauty, and sing for at least ten minutes. I like to imagine that should giants ever come upon our landscape, they would pluck at least two or three jacaranda trees and take them back to their homes, put them in lovely vases and enjoy their bouquet of purple on their tables. Here is a full shot of the jacaranda tree. It's vital to be growing through your life rather than going through your life. The object is not to change other people or situations; it's to do the inner work they stimulate. This is one of my two favorite trees. I just began pointing it out to Madelyn last week. Can't wait to hear her say it. Just a quickie - I'm too busy singing to the lovely and very purple jacaranda tree that doesn't live in the UK but it's very very pretty in your pic!! I hope the jacaranda likes my ditty - I'm singing "Oh what a beautiful morning" from Oklahoma and "Autumn leaves" - heheheh! And thank you for a lovely monday quote! Keep growing through life people - never stop - such wise words!! BB what gorgeous trees...we don't have them here in NC. I agree everyone should stand underneath one at least once a day while they are blooming. I love the color. Beautiful! Reminds me of my childhood in Harare (Zimbabwe), famous for its jacaranda-lined avenues. 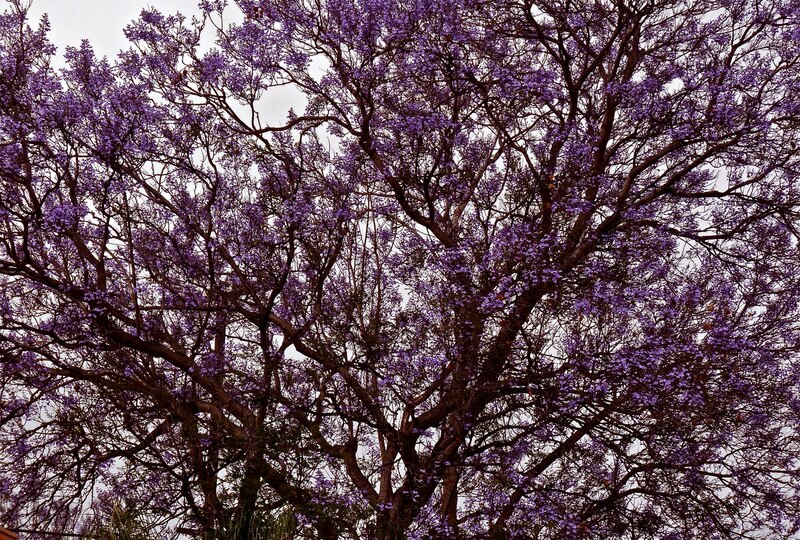 The jacarandas are beautiful. It would probably not be a good idea for me to sing under the tree. The off key warbling would probably make the tree fall. Just wondering if you got my email I sent to you yesterday? Beautiful! I bet the angels sing around those trees. wow - i've never seen such a tree! it's very beautiful, though! i'm sad today, betty. these images made me smile. thank you. So lovely. You're right, I needed a tree today. Although, if there are hundreds of the trees in your town and every time you see one you stand there for ten minutes singing, how do you get anything done? Trees and flowers lovely. Quote from Amos, even more so. Great reminder...it's all from within. That's a lot of purple. Beautiful trees, Miss Betty. My personal favorites are the Magnolia trees. Such gorgeousness. What a beautiful tree! It's too hot here (100+) everything seems to be crunchy. At least in my front yard. LOL. I feel calmer and happier just looking at those photos! Beautiful! Purple is my favorite color. I LOVE these trees! Thanks for posting the photos. I've never seen this quote, but I'm going to copy it. Love your pics, they rock! Esp. that last one. That shade of purple is to die for. I've said it over and over "The Good Lord Sure Paints A Pretty Picture" Thank you for sharing these with us. Never seen those before. They're beautiful! Hello Bossy Betty! Thank you for visiting my blog, and your comments! I enjoy reading them. Today I was having difficulties with blogger, and unfortunately, your comment never posted. I don't know which I love more, the gorgeous pictures, or the thought-provoking Amos quote at the end! Just terrific, Betty! I definitely need to focus on the "growing" through life! Thanks for the reminder!! These are very beautiful Betty. Where are they at? Happy Monday morning...although it is now the afternoon...which I have to admit I prefer. I have never seen one of these before..it is gorgeous...almost electric in color...are they fragrant too? The closest we have here to it is the lilac bushes or perhaps the purple rhododendrons or azaleas. I guess I'm gonna be the only one here to "tell it like it is!" 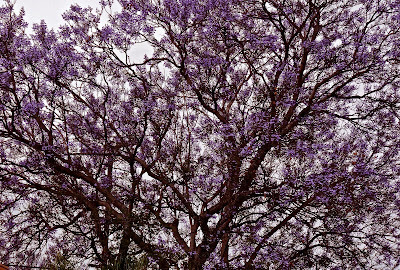 Jacaranda trees are beautiful! Okay, I got that out of the way. The city we used to live in (Lakewood) had tons of them on the streets. We had the great misfortune of living with a huge one in front of our house. They are the messiest trees known to mankind. They shed leaves, bark, and those STICKY purple flowers. They stick to your car, they stick to the sidewalk, and they stick to your shoes. A doormat does no good, you are tracking those flowers in the house. I love those trees!! I actually have one right in my front yard and I love the purple blossoms. They truly are beautiful!! WOW, I can't say it enough, I love your pictures! btw, what kind of camera do you use? a lovely contrast to our great oaks and pines. I've never seen a tree blossom like that. I love the deep purple color. Almost psychedelic. I love the singing idea! We don't have jacaranda trees here (at least, I don't think we do), but we do have redbud trees which are so amazingly beautiful when they're in bloom. Thanks for the purple tree. It is so very pretty. How's my song so far, Betty? 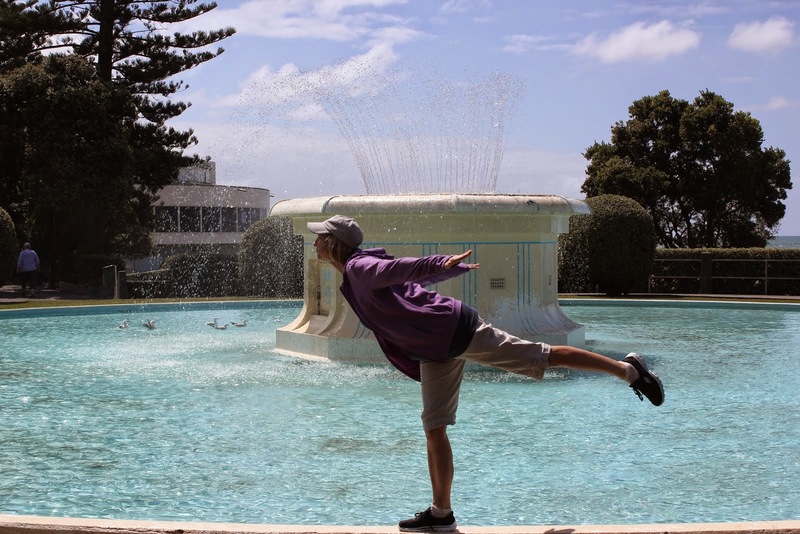 I really like the quote (and the jacaranda trees), but not my singing. Those are beautiful trees. They look like perfect flowers for hummingbirds to dip into---have you ever seen any hummers around these trees? Oh I've been missing your posts. Thanks for the inspiration. I have never seen one of these trees. Beautiful. And the quote was so good. Growing..not going! How beautiful! I've never even heard of a jacaranda tree before, so I'm fairly sure we don't have any in Maryland. Our loss! I like walking through a grove of Jacarandas when the blossoms are falling. Purple snow! Those are incredible! We should all stop and admire the trees a little more. Beautiful tree and wonderful quote. Afraid I'm having problems with my inner workings. Love the end quote. Beautiful pictures! I liked the visual of the giants plucking these trees to put in vases at home. Awesome!! Lovely! Never heard of or seen this tree, but I'd love to have one in my front yard. Oh my gosh, that is just a gorgeous tree! I'll have to add that to my list of favorite trees! Do the blossoms smell pretty? Yeah... it was a short wait. Today she said, "Jacaran puhpull fall off the twee." I love that image of a giant just plucking one of these trees up to enjoy at home in a little vase. It brings to mind ideas of me as a giant...am I plucking up the lovely scenery at some spiders abode? I'm going to re-read this post and take it in again. . .
We have one of these in our front yard. I didn´t know they grew up north also. I love them. The color is just awesome and no picture can do it justice.